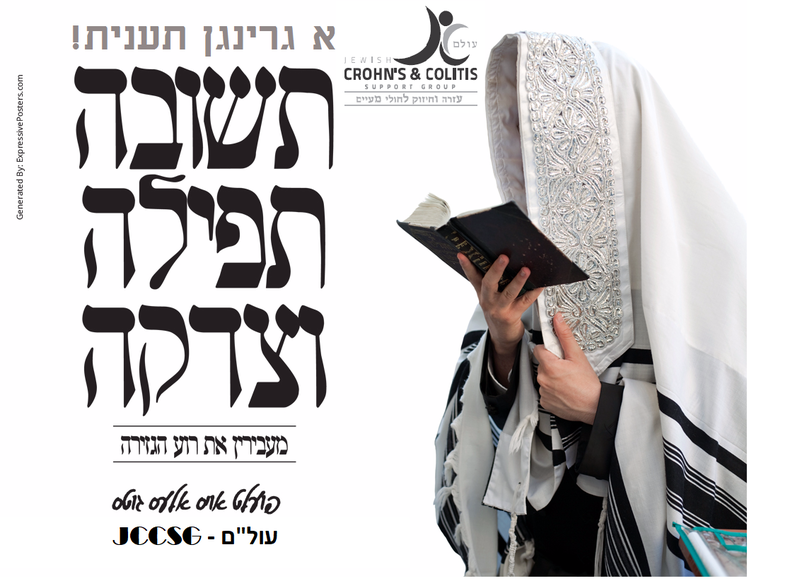 JCCSG ~ Jewish Crohn's & Colitis Support Group: Yom Kippur info. A Git Gebencht Yur! Have an Easy fast! Yom Kippur info. A Git Gebencht Yur! Have an Easy fast! We at עול"ם - The Jewish Crohn's & Colitis Support Group (JCCSG) would like to wish you and your family again, a good and sweet, and prosperous year. A year filled with Good health, well-being, happiness, success, Nachas, Parnasah and all you need. May we all be inscribed and sealed in the Book of Life. As a reminder, please discuss with your Rabbe/Rav/Dayan ANDDoctor regarding your fasting, taking your medications, and/or about taking IV (Intravenous) fluids. The providers where you should call to arrange are asking you to call early enough so they should have the Fluids and it should not take that long for them! Remember, they are volunteers! Please call: 845-659-5886 to arrange it. Please call: 845-537-0014 to arrange it. Please call the Lev Rochel Bikur Cholim of Lakewood, 732-905-3020 to arrange it. Please call Refuah V'Chesed, 514-357-2167 Ext. #8. REMEMBER: The same Torah which commands us to fast on Yom Kippur tells us that "V’Nishmartem M'od L’Nafshotaichem" - "Take care of your health/guarding our health" is far more important. Again, you need a prescription in order to get the IV, no exceptions! So please make sure to have it!